I'm definitely making more of an effort these days with my appearance. I was looking at some old pictures today in an effort to find solace, and was amazed at how many nice clothes I used to have. Where are they now! I used to make so much effort with what I wore. However there are some pictures from a time in my twenties when things were not working out so well for me. My facial expression looks blank, I'm overweight and I look drawn and pale. Kind of like now really, except for the overweight thing. I seem to have no appetite anymore. Anyway, I digress. 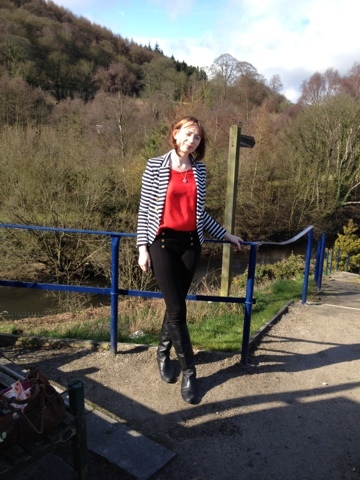 So in keeping with my deal with myself to make more of an effort, here is today's offering: red top from Zara £25. Button leggings also Zara £20. Jacket H&M £29.99. On a windy Yorkshire day. Aw thanks! When I saw the pic I thought, "hmm it looks like I'm going to an interview!" I like them altogether, what a yummy mummy! Thanks! Not sure it was worth getting so dressed up for a trip to the local market but there you go! Love it, looking very stylist and stripes or what I deem 'anything a Parisian' would wear works for me! Love this outfit - especially the jacket. It works really well with the bold red. A great look!